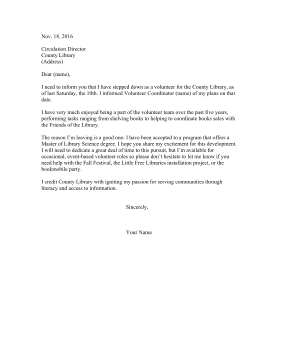 Library volunteers can use this sample resignation letter to withdraw from service and activities. I need to inform you that I have stepped down as a volunteer for the County Library, as of last Saturday, the 10th. I informed Volunteer Coordinator (name) of my plans on that date. I have very much enjoyed being a part of the volunteer team over the past five years, performing tasks ranging from shelving books to helping to coordinate books sales with the Friends of the Library. The reason I'm leaving is a good one: I have been accepted to a program that offers a Master of Library Science degree. I hope you share my excitement for this development. I will need to dedicate a great deal of time to this pursuit, but I'm available for occasional, event-based volunteer roles so please don't hesitate to let me know if you need help with the Fall Festival, the Little Free Libraries installation project, or the bookmobile party. I credit County Library with igniting my passion for serving communities through literacy and access to information.